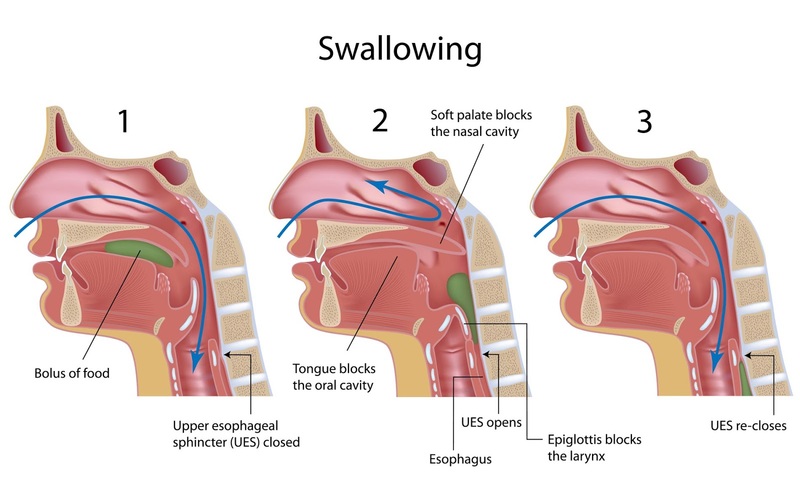 food "sticking in the throat"
When the above symptoms are noted by physicians, nurses or therapy staff, a speech-language pathologist (SLP) is consulted. Patients hospitalized for neurological disorders such as stroke, brain injury, Parkinsonism, or ALS likely are on the SLP caseload. Swallowing requires timely and effective coordination of many muscles. When these do not operate efficiently, ingested substances can enter the airway and endanger patient health. Assessments begin at bedside with behavioral observations. In addition to bedside evaluation, the SLP can perform tests such as a modified barium swallow study (MBSS) or a fiberoptic endoscopy study (FEES). The MBSS uses barium, a white substance that shows up on X-ray, indicating the path of ingested material. The FEES uses a camera above the vocal cords and color-tinted food, so the SLP can assess efficiency of food transfer. These tests also help determine whether there is "silent aspiration." Liquids especially can penetrate into the airway, without coughing, in serious cases of impairment. When patients say they have no trouble at all with liquids, there can still be a dangerous problem. After determining the nature of the problem, several approaches may come into play. With silent aspiration, or in very severe cases of dysphagia where management is not immediately possible, feeding tubes may be necessary. A nasogastric tube (from the nose to the stomach) or a PEG (percutaneous endoscopic gastrostomy) tube may be placed to provide nutrition until the patient's condition improves. The good news is that swallowing often improves with therapy. This depends on the nature and severity of impairment. It is important to report these symptoms to one's physician and to follow recommendations. Avoiding aspiration pneumonia also means avoiding severe health complications.